This is the third post in the continuing series 31 Tips to Spend Time Properly. These tips will help you invest your time more wisely, productively and energetically each day. Some of the tips can be done immediately; others require cultivation. All are time well spent. Tips 13-16: Manage your paper and digital files. 13. For home or office, if you do not own a filing cabinet to hold your files, purchase one. 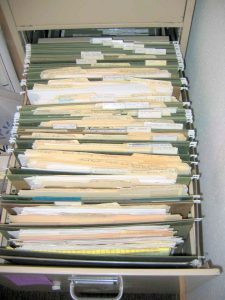 Yes, believe it or not, some of my clients did not have a filing cabinet or consider access to one important. And their desks and table tops proved it! The proven foundation for building a successful and stable filing system – whether with paper or digital files – is a readily accessible file cabinet. 14a. With that said, do not buy file boxes or file crates or file tubs for your home office. Just like you wouldn’t buy a 2-burner stove for your kitchen, you shouldn’t buy a cheap way to file your files. You need a two, three or four-drawer cabinet. 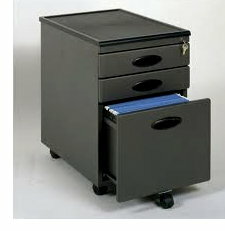 And if you have limited number of files and need extra drawer space, why not consider a file cabinet on rolling casters like the Cymax studio mobile file cabinet? There’s a cabinet available for every need. 14b. Make sure the file cabinet you purchase has sides to the drawers. These sides are used to hang hanging files in the drawer. 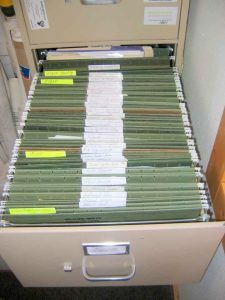 If your filing cabinet does not have sides then you will have to purchase a frame that you will have to assemble and place inside the cabinet drawer. It’s a royal pain. If you buy a cabinet without sides, you will quickly dislike your filing system. 14c. Also, make sure the file cabinet you purchase is called a full extension cabinet. A full extension cabinet is one where you can pull the drawer out to its full length. Some file cabinets only pull out half way, and you can barely reach the back half of the files. Again, this is a royal pain. If you buy a cabinet that does not fully extend, you will quickly dislike your filing system. 14d. No sides and not fully-extendable file cabinets? You will hate your filing system and cease using it! Before and after of the same file drawer! 15a. While many of my clients have one or more file cabinets, fewer consider how they store or back up their digital files. Sooner or later, your computer will crash or your hard drive will eat some or all of your data – just when you can least afford the time and distraction. Consider a free cloud storage system like Dropbox or Google Drive. They are drop and drag systems that look just like the digital file folders in your Windows or Mac system. And to make things even easier, you can share those electronic folders with others without having to email the files back and forth. 15b. While those cute, tiny and cheap flash drives that fit on your key ring are wonderful for keeping key digital files handy, they can be a pain to maintain as a long-term storage solution. 15c. A successful long-term digital file storage solution must be automated. 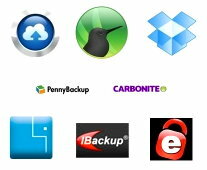 An example of a cloud-based, automatic backup system is Mozy, the one I use. If you google “online backup reviews” you’ll get a ton of links that lead to comparisons of services, like cloudfinderstorage.com or online data backup review. The best services run in the background of your operating system and back up your files as they are created or updated. A meltdown of your computer is always distracting, but it doesn’t have to be disastrous. 16a. File your paperwork every day! Yes, every day! As I posted in my article, Faster than you can say, “Jack rabbits!”, you wouldn’t think of letting the dishes pile in the sink even for one day, so never let your paperwork pile up. Process part or all of it every day. 16b. Ah, the joy of automated digital file backups. No fuss, no muss, no worries, no effort. Always current, no file duplication, always safe from the blue screen of death. How sweet is that!